Born in Apatzingan, Michoacan, began her journey as a painter under the teachings of artist Oscar Solis, who, as her mentor, was the person instrumental in helping her to achieve images filled with intense color. The artistic aim of Juana’s paintings is to convey the essence of her roots and leave that information for future generations. She has a degree in Biochemistry and has worked as a chemist, mother and housewife. 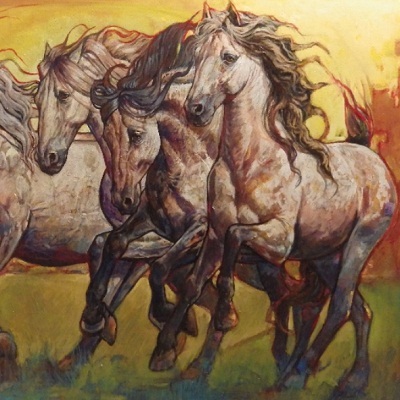 Once her husband became better known, Juana started assisting him with his paintings until she finally had her first solo show in Ajijic in 2005 at the Gathering Place Gallery. Now Juana has a following of her own. She and her husband now often switch styles, but Juana has a beauty that radiates from within and it is the same light that is unmistakable in the breath of her female subjects. 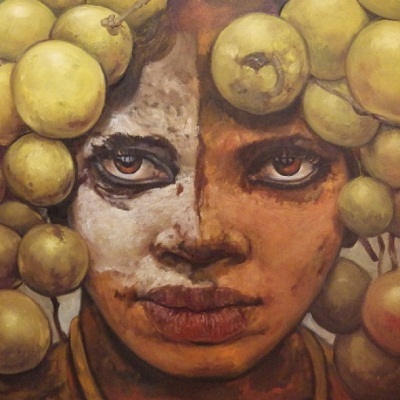 “The work of artist Juana Cortez represents the reality of the world she knew through her grandmother – a proud member of an indigenous group rich in culture and rituals.” Juana & Oscar, both great artists, like to paint different cultures, but Juana says there is still some competition between them. While Juana depicts the various Mexican cultures in their traditional dress, detailing out the lace and fabrics. Oscar paints everything from horses, birds, still life, nudes, Africans, anything so as not to get bored or trapped with anyone subject. They are such a delightful couple. Anyone who meets them are impressed with their gentle, soft-spoken manners and their incredible talent. Their paintings say it all, so we will say no more. Was born in Apatzingan, Michoacan in 1958, where he started sketching as a youth. Oscar excelled in the drawing classes at his primary and secondary schools, and as a teen, realized he wanted to become a painter and taught himself how to paint. With confidence and inspiration he left home and headed to Guadalajara to become an artist. This undertaking proved to be more difficult than he had imagined. When he first started out, Oscar went door-to-door, earning a living by painting portraits. As most artists do, he has continued to experience many ups and downs in his career. One of the most dramatic and challenging periods began in 1986 when he decided to give up painting and burned all his paintings, oils, brushes and easels. Refusing for the next ten years to even touch a brush. Eventually, though, he did touch a brush again, and the results were amazing.